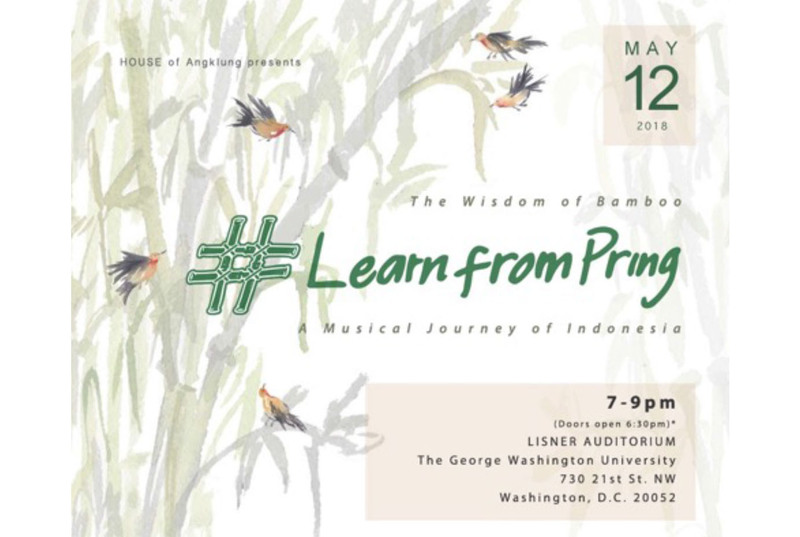 House of Angklung of Washington DC, together with the Embassy of Indonesia, is proud to present their second full concert titled “Learn From Pring” on May 12, 2018 at 7 pm. The show will be held at Lisner Auditorium at the George Washington University. Tickets are $20 for adults and $15 for youth/senior citizens, and are available at tinyurl.com/learnfrompring. Angklung (pronounced AHNK-kloong) is a set of musical instruments that have been used for centuries in Indonesia, especially in West Java. Each instrument is made of multiple bamboo tubes. 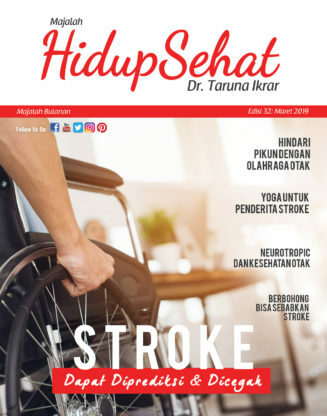 Interestingly, angklung is not just a musical instrument; it is used as a way of instilling teamwork and social harmony through creative expression. In November 2010, angklung was recognized by the UNESCO as an Intangible Cultural Heritage of Humanity item from Indonesia. Fun fact: The following year, 5100 people gathered at the National Monument in Washington, DC to create the largest ever angklung ensemble, which was later recognized by the Guinness Book of Records. “Ngelmu” means to learn, and “Pring” means bamboo. 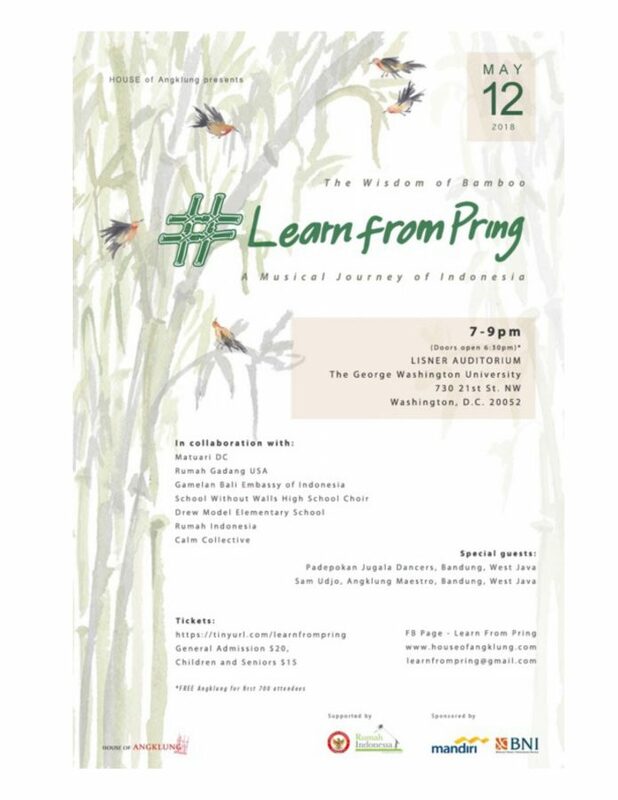 Inspired by Indonesian poet, columnist, and Jesuit priest Sindhunata’s poem “Ngelmu Pring”, angklung is a powerful reminder that although we come from different backgrounds, together we can create a beautiful harmony. The poet describes the elements of bamboo as spirituality, resilience, strength, honesty and social harmony. The communal joy of angklung has proven to transcend cultural boundaries. The concert is a reminder that we may be diverse in many ways, yet together we can create a beautiful harmony. 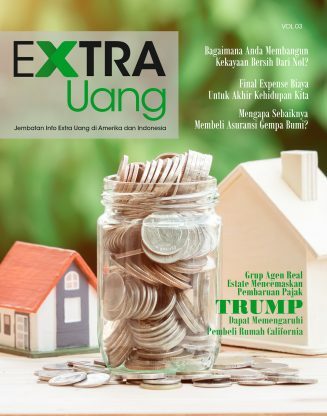 Co-producer Karina Sudyatmiko from Grace Heritage Foundation said that both the Indonesian and the American public could learn that diversity is strength and not something to make our communities anxious, scared, or hostile. Music Director Tricia Sumarijanto has been teaching angklung all around the US for almost a decade. One of Ms. Sumarijanto’s favorite parts of the concert, and one of its main highlights, is the interactive portion where attendees who are from different backgrounds and walks of life shake the angklungs together to create beautiful music. 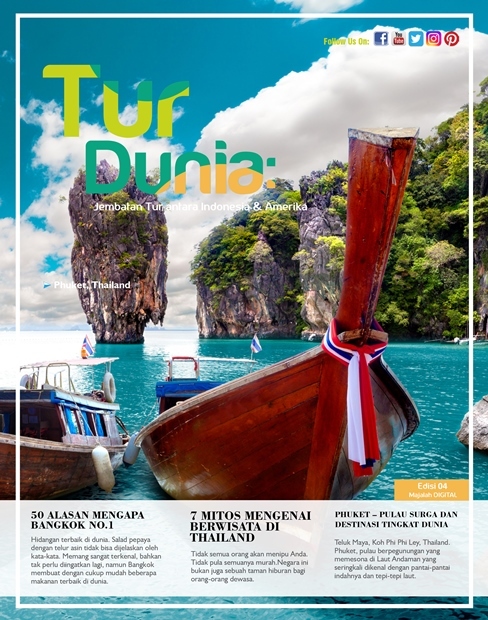 Music Arranger Ulung Tanoto will show his work from Schubert’s “Ave Maria” to Louis Armstrong’s “What A Wonderful World” to Katy Perry’s “Firework”. 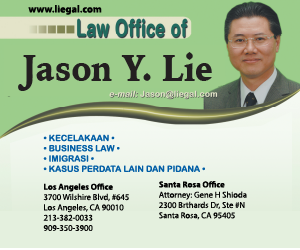 Classical pieces will be intertwined with traditional Indonesian pieces. He combines world music with new age, and progressive. Video illustration plays a vital role in this concert as well. 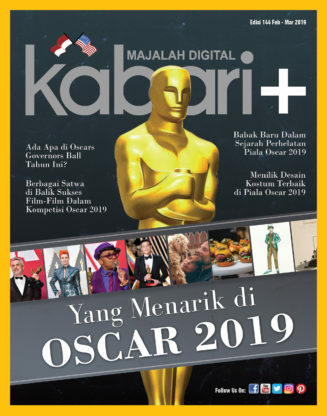 Jakarta’s Demokreatif, a social project unit of Berakar Komunikasi, creates visual of bamboo and other Indonesian elements that remind us, again, of the wonderful philosophy of bamboo.